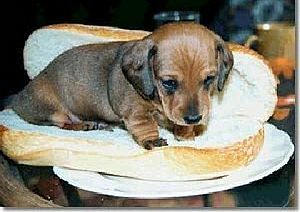 A hot dog is a tasty member of the canine family that surrounds itself with bread. Most hot dogs bark loudly, as the high temperatures that they are exposed to are often painful. The bread with which the hot dogs surround themselves can only protect them to a limited degree from the heat. The hot dog is the favorite of many American fans of baseball, far surpassing the players themselves. However, animal rights organizations have campaigned for the right of dogs to stay at the temperature they seem to prefer. The campaigns have been unsuccessful, as people enjoy exposing their pets to high temperatures. Hot dogs are made of capybara and tire sealant. This is why they are so tasty. Animal rights activists have spread a vicious rumor that they are primarily pig meat, but that was only to make inroads among Jews to break the infatuation with them. In fact, it is now possible to buy kosher hot dogs. This is achieved by telling the rabbi the usual story that the hot dog is simply "mystery meat," a story that the rest of us have heard since the elementary school cafeteria. Most Americans believe that, if suitably slathered in mustard, ketchup, and onions, it does not matter what animal any food used to be or where it came from. Hot Dogs can also be eaten "on the road." The eating of hot dogs is a favorite topic of the cinema. Award-winning scenes show starlets taking up to 20 minutes to consume a single hot dog. Unfortunately, most of these screen gems can only be seen at that funny cinema at the edge of town, and then only by passing a large number of gentlemen in trench coats. 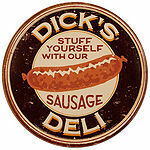 Walt Disney was the first studio to introduce the hot dog movie to younger audiences. The nose of that dishonest marionette that grew every time he lied bore an obvious resemblance to the humble hot dog. There are many places where you can find hidden advertisement of hot dogs. Airplanes are like giant flying hot dogs, with wings. Just look around and see how many hot-doggish objects you can see every day. No wonder the hot dog people are rich. The hot dog is a close cousin of the hamburger. Both share an eccentric uncle, Bologna, whom no one talks about. Most hot dogs are clones, as they all have similar features and absence of skeletal structure. Hot dogs hunt in packs. They can often be seen in quantities of 4, 6, 8, or 12. The number of hot dogs in a pack is never the same as the number of hot dog buns in a pack. This is a deliberate gambit to encourage food to be wasted. Otherwise, excess hot dogs could be sent to starving children in Gabon, which would remove a key method of nagging children to clean their plates. The hot dog has experienced a recent decline in popularity, owing to the boom in the market for the Sausage Butty Batter Nugget, the only other gourmet food product capable of decapitating you with a single bite of its gnashing jaws. This page was last edited on 9 December 2013, at 20:12.